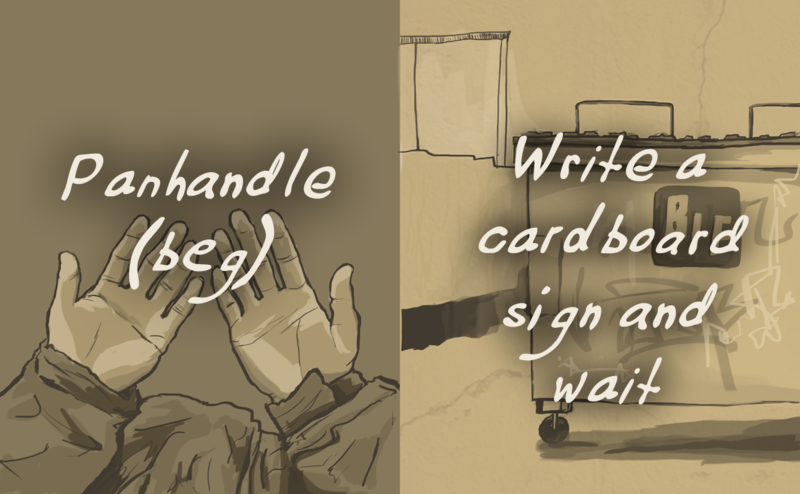 Go through a day as a homeless person and strive to change your future! This game is made for the Integrating Activity at JAC. There are many reasons why people become homeless, from the simple fact of losing a job to family violence and various types of addiction or abuse. 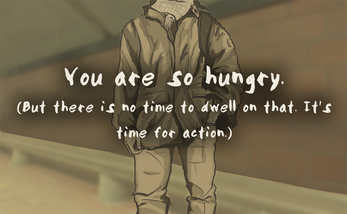 This game, however, focuses on the everyday problems and setbacks a homeless person is likely to encounter in Montreal. This is beautiful and heartbreaking and genuinely left me with tears in my eyes and a lump in my throat. Well done, this is a great little game with a powerful message. Rated 5/5 stars. Heartbreaking and beautiful game. 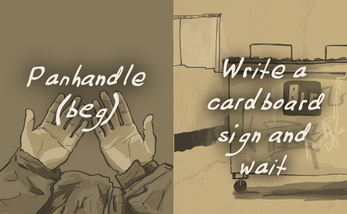 Thank you for making this and spreading awareness of homelessness in a way that forces players to empathize. again! please don't disrespect other people! i understand that you don't like the game, but that doesn't mean that you can go around thinking you have the right or that you are ENTITLED to disrespecting other people and their opinions! it's just rude! Surprinsingly Adobe Flash is still around. Didn't it go Dinosaur along with Shockwave? Hello! This is an ongoing issue with Adobe Flash going "extinct" indeed. I am looking into porting the game to another platform. Any chance this could be ported to a different platform? What did you make this with? There's also other resources out there for transferring Actionscript to Typescript! Thanks for the game experience. The various scenarios are frustratingly realistic (& familiar), although I'm impressed that $3.71 can get you 3 burgers from a fast-food joint in Montreal. I notice that all possible game scenarios seem to lead to the player surviving to see another day. Providing 1 or 2 less optimistic outcomes would perhaps more strongly drive home (so to speak) the harsh reality of homelessness. Furthermore, it might be worthwhile to provide the option to play as a female (instead of male) protagonist. Besides being more vulnerable to physical harm & exploitation, homeless girls & women also face additional difficulties & burdens that help organizations & members of the public tend to overlook. Thank you! I fully agree with your feedback, this game was done for a school project and barely scratches the surface of the complex issue of homelessness. There is certainly a lot more to be said and shown that I will definitely keep in mind if even I revamp the project. It says I need to download adobe flash, but I already have adobe flash. It is the sweetest game EVER!! I'm going to follow in my Mother's steps and Give money to every homeless (unfortunate) person!!! wow i tried all endings and it just opens my eyes. its heart breaking to know that this is what some people have to deal with. Great one! Stuffs we don't stop to think about. Good job there, congrats! 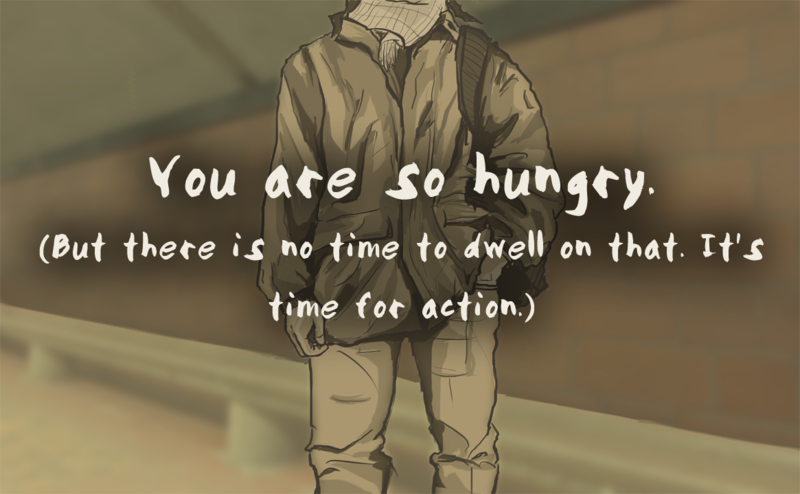 Short, but well done game; it was a good prompt for discussing homelessness. It was particularly interesting for Nani, because she's unemployed right now. We had a few questions about how you made the game. They're in the video. If you can, I hope you could comment on them for our audience. Nice work! Many thanks for commenting on our video with answers to our many questions about what inspired you to create this game and how you created it! Super cool game with a great story! Check out my play through! Thank you for playing and for the video! I'm glad you are looking to raise awareness on the issue of homelessness, as it is also my goal with this game. Homelessness is a complicated issue (far beyond the scope of my simple story) and I encourage you to learn more about it! Thank you for playing and for the video playthrough! Hi! I am a Senior at Western Washington University in Washington State and am doing a project on Information Communication and Technologies for the homeless. I'm working with a group of students to develop a simulator similar to yours to help others understand the struggles of being homeless. I enjoyed playing your simulator and would love to talk to you more about how you created it. If you have any free time to talk about your simulator my email is dsand1126@gmail.com. Thank you!